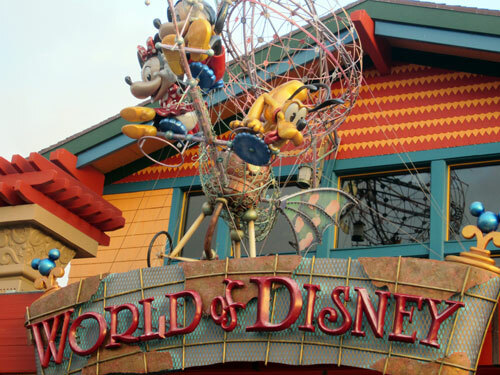 The four Disney theme parks, considered individually, are some of the most popular entertainment destinations across the globe, and collectively they leave all other entertainment resorts in the dust. 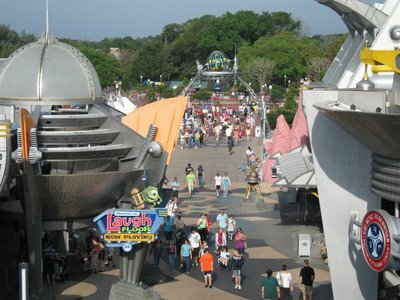 The four theme parks are the Magic Kingdom, Epcot, Disney’s Hollywood Studios, and Disney’s Animal Kingdom. They range in nature from the pure escapism of the Magic Kingdom and Hollywood Studios to the “edutainment” of Epcot and the Animal Kingdom that seeks to inform visitors about important topics in a fun and amusing way. Whatever your vacation preference, Walt Disney World has something for just about everyone. The Magic Kingdom is the original Walt Disney World theme park, and has been open since the resort’s debut in 1971. 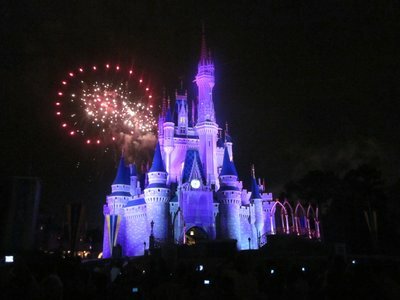 It remains the most popular park at Walt Disney World, and by annual numbers it is the most popular theme park in the world. The icon of the Magic Kingdom is Cinderella’s Castle, which stands in the very center of the park. The kingdom is divided into four main lands: Adventureland, Frontierland, Fantasyland, and Tomorrowland. 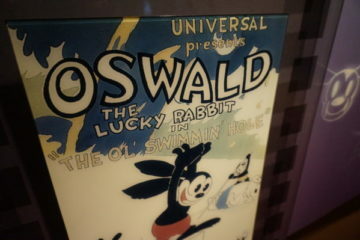 It also has two smaller themed areas named Main Street USA, and Liberty Square. Cinderella’s Castle is beautiful day and night. Visitors enter the park by strolling down Main Street USA, which is primarily a shopping area featuring 19th century architectural styles from across the United States. The street also includes several restaurants, and is one of the stations for the Walt Disney World Railroad that circles the park. At the end of Main Street is a circle featuring a statue of Walt Disney hand-in-hand with Mickey Mouse, and Cinderella’s Castle towers just beyond. 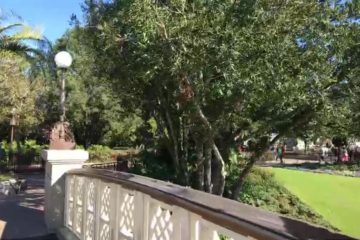 From this central circle visitors can head left to Adventureland, Liberty Square, or Frontierland, right to Tomorrowland, or straight ahead through the castle to Fantasyland. If you have dreamed of exploring exotic lands across the sea, Adventureland is the place for you. Attractions in this land include a jungle safari, a magic carpet ride through Arabia, a visit to Polynesia, and a tour among Caribbean islands swarming with pirates. This area is home to the Pirates of the Caribbean dark ride that inspired the popular film franchise, and elements from the films have been incorporated into the original ride. Fun totem poles in the Magic Kingdom’s Adventureland. This relatively small themed area has two main attractions: the Hall of Presidents stage show and the extremely popular Haunted Mansion. The area is designed to resemble colonial-era America. Frontierland is all about the American Wild West, with attractions like the abandoned mine roller coaster Big Thunder Mountain Railroad, and the interactive Tom Sawyer Island that was inspired by the novels of American literary icon Mark Twain. The log ride Splash Mountain, which builds to a steep drop down into a outsized briar patch, is another of the most popular attractions in this area. Tomorrowland is dedicated to the world of tomorrow, with attractions celebrating space travel and other kinds of futuristic transport. Visitors can drive a race car around a track, taking a soaring ride on the Astro Orbiter, or brave the Magic Kingdom’s most exciting indoor roller coaster – Space Mountain. Tomorrowland celebrates the future in a fun and funky way. Visitors enter Fantasyland by passing through Cinderella’s Castle, and exiting into the middle of a medieval faire. With an abundance of dark rides and other relatively sedate adventures, Fantasyland is the favorite area of younger Disney guests. Signature attractions include Peter Pan’s Flight, Dumbo the Flying Elephant, Snow White’s Scary Adventure, and the Many Adventures of Winnie the Pooh. The second most popular theme park at Walt Disney World, Epcot opened in 1982 as a celebration of human culture and technological achievement. Roughly hourglass-shaped, Epcot is divided into two distinct areas: Future World and the World Showcase. 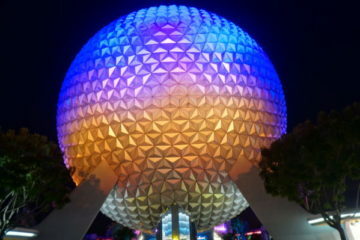 The enormous geodesic dome of Spaceship Earth is the symbol of Epcot. Future World is dedicated to showcasing cutting-edge technology in areas that range from communication to energy to agriculture. In addition to serving as the icon of Epcot, Spaceship Earth is also the most popular attraction at Future World, taking visitors on a 13-minute dark ride about the history of communication from prehistoric times to the present, and beyond. The base of the Epcot hourglass is the World Showcase, featuring eleven country pavilions encircling the World Showcase Lagoon. 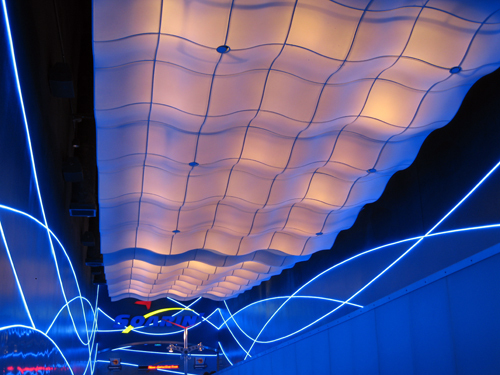 These country pavilions feature architecture, food, merchandise, and entertainment representative of the modern and historical culture of each location. The World Showcase has the most impressive variety of restaurants anywhere at Walt Disney World, and presents entertainment that ranges from music to dancing to acrobatics. 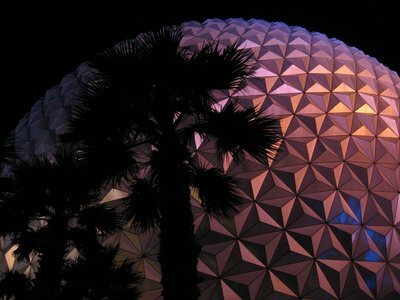 Spaceship Earth is the iconic building and attraction that represents Epcot. Designed to resemble 1930s Hollywood, Disney’s Hollywood Studios is a celebration of movies themselves. Although it has six separate areas like the Magic Kingdom, Hollywood Studios has a more haphazard layout and a consistent theme throughout the entire park. 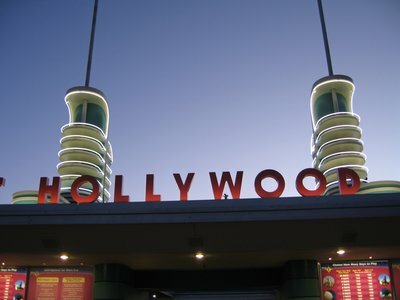 Every attraction at Disney’s Hollywood Studios is tied to a feature film or television show, and many are either live stage shows, stunt shows, or short films. There are also a few very popular thrill rides including the Twilight Zone Tower of Terror and the Star Wars inspired simulation ride Star Tours. At night, guests flock to the popular Fantasmic show that lights up the horizon with lasers, projections, fountains, and other special effects. Disney’s Hollywood Studios opened in 1989, and is currently the fourth most popular theme park at Walt Disney World and the eighth most popular park worldwide. 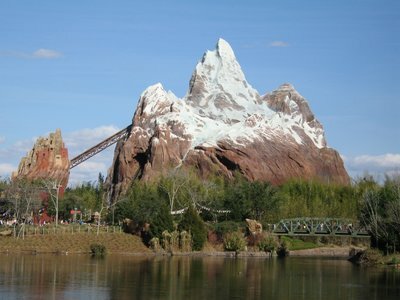 The newest of the Walt Disney World theme parks, Disney’s Animal Kingdom opened in 1998 and quickly grew in popularity. It is the largest park at the resort when measure land mass, covering over 500 acres, and includes many acres of open wildlife reserve. Symbolized by the towering Tree of Life, Disney’s Animal Kingdom is a celebration of wildlife conservation. 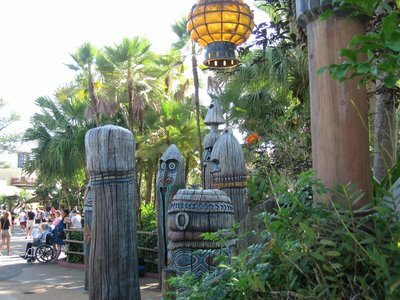 Disney’s Animal Kingdom has seven different areas: Africa, Asia, Rafiki’s Planet Watch, Oasis, Camp Minnie-Mickey, DinoLand USA, and Discovery Island in the center. The home of the Tree of Life, Discovery Island has paths that stretch across Discovery River and connect the other themed lands to each other. Disney’s Animal Kingdom is a hybrid of a zoo, an interactive playground, and an amusement park complete with thrill rides. 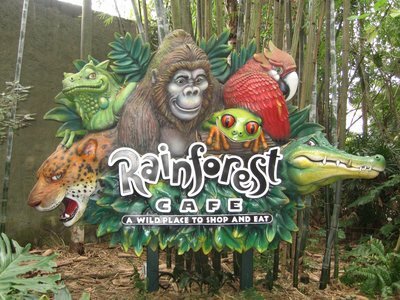 It has exciting roller coasters such as Expedition Everest and Primeval Whirl, interactive play areas such as the Boneyard, and over 250 different wildlife species in a variety of exhibits. Thrills abound at Disney’s Expedition Everest. In addition to viewing wildlife in designated exhibits within the main areas of the park, Africa is also a gateway to an extended wildlife preserve that visitors may visit on the Kilimanjaro Safaris. This preserve is home to a variety of native African plant and animal species, and many of the herbivorous savannah species roam together on the grasslands.